Throwaway Style is a weekly column dedicated to examining all aspects of the Northwest music scene. Whether it’s a new artist making waves, headlines affecting local talent, or reflecting on some of the music that’s been a foundation in our region; this space celebrates everything happening in the Northwest region, every Thursday. A legendary group tearing up stages, breaking up way before their influence set in, only to get back together and receive partial karmic payment for the style of music they helped pioneer. Gorgeous shots of Downtown Tacoma and the skyline of Seattle from Northbound I-5. The story of a kid and his father bonding over music. The chest-puncturing, machine gun rattle of the open of "The Witch." Luminaries including but not limited to Mark Arm, Nancy Wilson, Jack Endino chatting about the mark this band left on their lives and generations of music fans. Trips to UK record stores to investigate the fervor over this band. There are many ways Jordan Albertsen could have approached covering the history of the Sonics in his documentary BOOM: A Film About the Sonics, but the approach he took reflected the personal effect music has on each of our lives. From members to spiritual successors to fans, BOOM puts the Sonics at the center of a big handful of orbiting entities, individual experiences cobbled together to celebrate the existence of this very special band. From being the scourge of radio programmers and packing teen dance halls all the way to their thunderous reunion (with a comprehensive look at the band's four-decade hiatus), BOOM took ten years, a great deal of emotional labor, and a lot of money out of Albertsen's pocket to produce. But as the cliche goes, hard work pays off. A recent award winner at both the Lone Star and Tacoma Film Festivals — nabbing a Best Documentary award at the former and the PNW Audience Choice award for best feature at the latter — the film serves as the definitive document for anyone interested in knowing more about the Sonics beyond the aggressively fun approach to rock 'n roll music displayed in their recordings. This Saturday, November 17th, BOOM will be showing at the 35th annual Olympia Film Festival, and as you might have been able to tell, it has been kind of a while since I've recommended a rock documentary this enthusiastically. Not too long ago, I spoke with Albertsen about his personal relationship with the band's music, the ten-year process of making the film, and why sometimes the art chooses the artist instead of the other way around. KEXP: So in the film, you talk about how your dad is the one who put you on to the Sonics. Tell me a little more about that. Jordan Albertsen: Well, it was when I was a kid. I was really into all the music that was in the northwest in the nineties. I was a big Nirvana fan. I was really into punk rock. And my dad just came walking by my bedroom one day and heard me listening to that music and he told me, "You should listen to the Sonics." And I'd never heard of them, I thought he was talking about the basketball team. At the time, the only music I'd ever heard my dad listen to was like Dire Straits, and Eagles and stuff like that. So I instantly thought that any music he would recommend would just not be cool. And I was wrong. He found a copy of Boom and gave it to me, and it just completely blew my mind. And that was really when my dad and I first started talking, outside of him being my dad and telling me what not to do. It was really what we bonded over. And that's how I was introduced to the band. Did he ever tell you about his relationship with the Sonics? Yeah. When he was in high school and college he lived in Bremerton. And he used to go see The Sonics. He would just tell me about how crazy those early shows were. My dad never really went to concerts or anything. He went to like five concerts in his entire life. And those five concerts happened to be the Beatles, Jimi Hendrix, Janis Joplin, he saw the Beach Boys on their Pet Sounds tour. It's just amazing, you know. In the sixties, his music experience was limited but totally incredible. He would just be telling me about going to see The Sonics at Pearl's, or roller rinks, cause they would play anywhere, The Armory in Tacoma. That's how incredible they were. You and your dad went to see their reunion show in New York, correct? No, not New York, we missed that. We went and saw them when they played their first Seattle hometown reunion show, which was at the Paramount Theater on Halloween night 2008. It was just incredible. That was the first concert my dad and I went to. It was so amazing. The Sonics are one of those bands. When you talk about band reunions, your wish list of band reunions, the Sonics weren't even on that list. To me, they were almost like a unicorn or something. They weren't real. And to see them on stage playing those songs, it was just so incredible. That was the first time I'd seen them, that was the first concert I went to with my dad, and that was the night that I decided I was going to make a movie about them. Tell me how you went through the process of contacting these guys. They get together for a reunion show, sure. It still seems a little difficult to get them all together. Very. I mean everything about it was difficult. I think I went home that night and I went on their website, and I found an email address that was just like "management at Sonic's dot com" or something like that. And I stayed up all night writing this really impassioned email to whoever that manager was about why I should be the person to make a movie about this band. And I got a response the next day, it happened to be Buck Ormsby. At the time he was managing the band. I instantly recognized his name, cause he's the bass player from the Wailers, and obviously I knew his name was on the back of all the Sonics records I had cause he was a producer, one of them. And I had lunch with Buck a couple of days later in Tacoma. And we had like a three or four-hour meeting and we shook hands and he was like, "All right man, let's do it." So Buck and I spent a good five years trying to raise financing for the film and it just didn't happen, the financing never came through. So I ended up just making it anyways. That's really how it came together. How did you go about making it without the funding? It was such a slow process. Ten years ago, when I first started trying to make a film, I was not an editor and certainly wasn't capable of taking on a project that big. But, over the years, I directed a number of music videos and ended up having to edit those, and became a lot more confident as an editor. That's the big thing. Editing and producing, just organizing interviews and stuff like that. I would knock off an interview here and there. I had an interview with Buck that I had already filmed. It's just such a long story, it's hard to piece it all together. So I had Buck's interview, I shot that probably four or five years ago. He had gotten sick and I knew that his story was really important, so I arranged his interview and got that out of the way. We did an Indiegogo campaign, and we were hoping to get at least $50-$150,000, and when that bombed, I kind of gave up on the movie. I really didn't know what to do. I didn't know how to do it without financing. It really wasn't until Buck passed away that I kind of went through and re-watched his interview and some of the b-roll footage that I had shot with Chris Koser, the cinematographer, and I started to see a different movie that I could make. Because originally, the plan was to film all these recreations of the past. I knew there wasn't any video footage or film of the Sonics from the sixties, so I was going to do some really high production value recreations. And I realized that there might be a different film in there. That was when I started focusing more on what happened to the band after they'd broken up, following Buck's story and how he pushed that music out there. That was how my story with my father got intertwined into the film. That was really in the last two years where this version of the movie came together in that way. It's so hard for me to walk through it. No, that was that was a good walkthrough of the process. I heard it took basically 10 years. I finished about three weeks ago. And I started it ten years ago. Yeah, it was unreal, man. I just knew I needed to make it. I think the other day I compared it to a cramp in my stomach. That's what it felt like. Every time that I'd give up on the film and want to walk away from it, it was like I was physically told that I had to finish this movie and I had to make it. I just wish it wouldn't have taken so damn long. It's still powerful, that urge to create, that urge when you know you have a story to tell. It has its way of nagging away at you until you actually tell it. Tell me about going over to London. How did you find out that the Sonics were huge over there? What led you to investigate? Well, I actually went on tour with the band. I was in Belgium, Germany, and the Netherlands, and then I ended up in London. And they did this show at Koko, in Camden. Every show they played there was this huge reception, a big fanbase, but there was something about London that was just unreal. And, Ivan, the DJ that I meet up with and walk around with, he was really the one that told me, "You need to come around Monday." I was there and I had a week in London. As you're watching the film and he's walking me around London, that's me figuring all that out. I really didn't know that they were that big until I was walking around London and I'm just like, Jesus Christ! Everybody we talked to, they were just so... way more than even in Seattle, the reception that you'd get, the people that you met. It's such a music-loving city. They really had embraced that band. It was really incredible. Everywhere you went you'd see t-shirts and posters. I don't know what the hell happened there, but it was incredible to see. What is your favorite story from the film? Oh, man. One of my favorite stories that's not in the film, cause it just didn't fit into the film. One of my favorite stories was when I was interviewing Nancy Wilson from Heart. She was this huge Sonics fan, and her first concert was when she was ten years old and she saw the Sonics at this roller rink, and listening to Nancy talk about what that experience was to her, it was just so incredible. She called it a "rock n roll baptism" I think is what she said. The way she described the energy in that room, and the crowd, and the band. That was my favorite story because it was really unexpected. Here's one of the biggest rock stars on the planet, talking about, she didn't exactly say that, but it was such a huge inspiration on her, and it was just such an amazing thing to hear. What is your favorite Sonics song and why? "The Witch." It's just...I'm a big punk rock guy, and I like songs that make me want to break stuff, and every time "The Witch" comes on, I just want to start ripping the room apart. There's nothing that hits harder than "The Witch," man. Are you a non-cis-male-identifying musician/producer looking to learn how to better use Ableton? You're in luck. 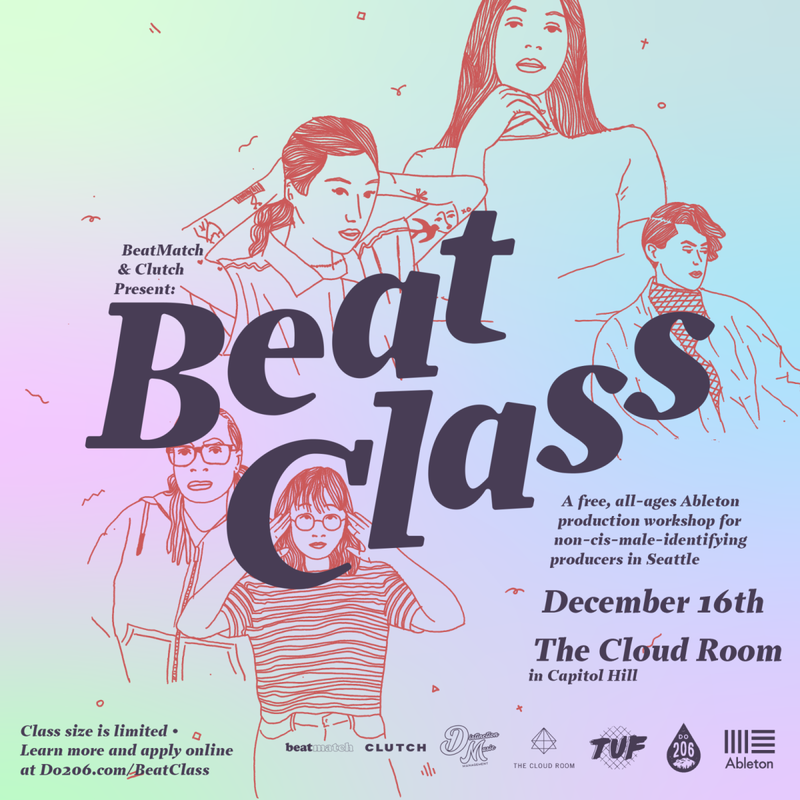 On Sunday, December 16th at the Cloud Room, BeatClass will be in session. From 1-5pm, SassyBlack and Jake Crocker will each be offering lessons to help maximalize your productions. The deadline for submissions is November 23th and the class is limited to 16 students, so if this sounds like something you'd be interested in, apply here today! All applications will be reviewed by a committee of non-cis-male-identifying producers, and if you made the cut, you'll be notified by December 3rd. This past Sunday evening, the legendary Tacoma band The Sonics played their first hometown show in six years. Martin Douglas explores their influence from the perspective of his twenty years as a Tacoma resident.